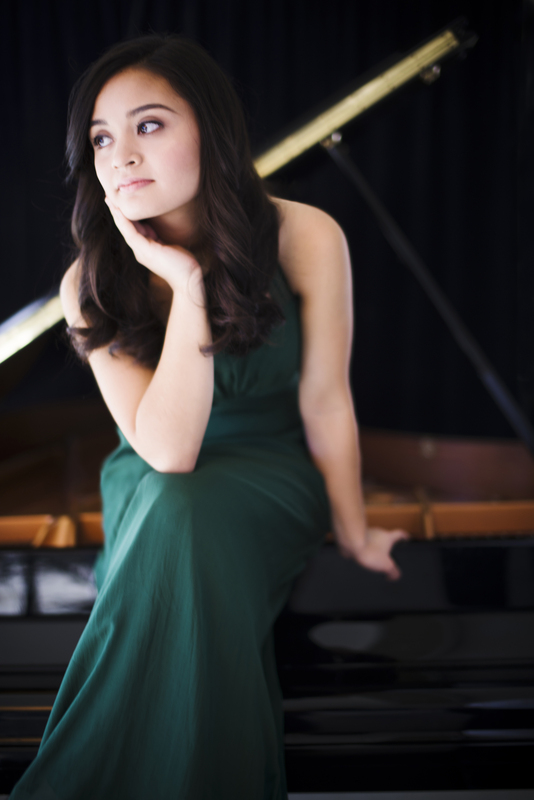 York Chamber Ensemble is pleased to welcome Charissa Vandikas performing the Beethoven Piano Concerto no. 4. 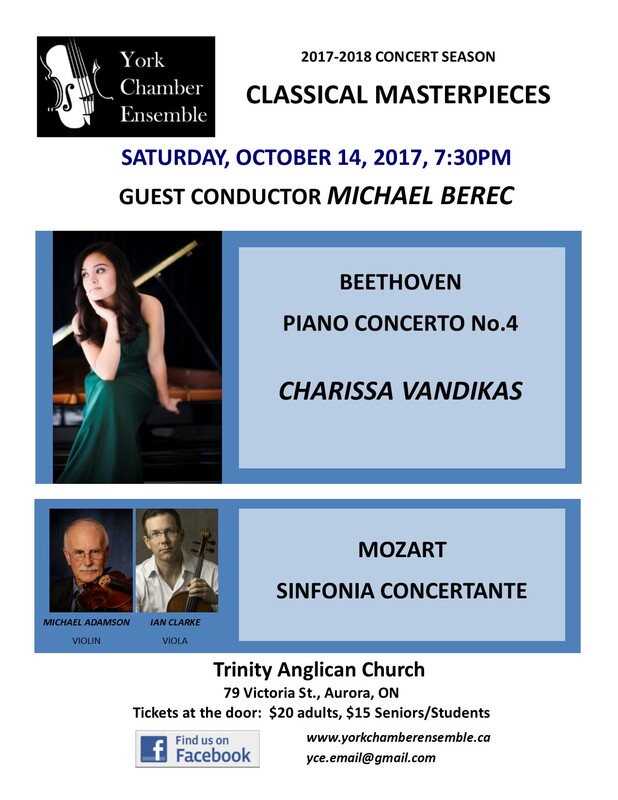 Join us on Sat Oct 14th 7:30pm at Trinity Anglican Church, Aurora. pianist has been featured in CBC’s prestigious list, “30 hot Canadian classical musicians under 30”. Representing Ontario after completing a 2014 fall recital tour around the province, she won the 2015 CFMTA National Piano Competition, held in Vancouver. She has been the recipient of several awards in various competitions, including the CanadianMusic Competition, the OMFA Provincial Competition, and the Glenn Gould School’s Chamber Competition and Concerto Competition. Her piano duo, La Fiammata, was this year’s Grand Prix winner of the Canadian Music Competition in the 19-30 category. La Fiammata was recently named the CMC Toronto Chapter’s Youth Ambassadors for the 60th anniversary of the competition. Charissa has performed in masterclasses with Robert Silverman, John Perry, Leon Fleisher, Jamie Parker, Janina Fialkowska, Emanuel Ax, and Simone Dinnerstein. She has appeared as a soloist in the Kitchener Waterloo Chamber Music Society concert series and in the Canadian Opera Company’s lunchtime concert series. In 2016, she was selected to be a Stockey Young Artist for the Festival of the Sound, in Parry Sound. Charissa made her orchestral debut with the Greater Toronto Philharmonic Orchestra in 2013 under the baton of David Fallis. She has performed with the Haydn Jeugd Strijkorkest in the Netherlands, as well as the Toronto Sinfonietta, Cathedral Bluffs Symphony, and the Royal Conservatory Orchestra. She’s excited to perform again in Koerner Hall in April of 2018. Charissa has attended the Peter de Grote Music Festival in the Netherlands and the Chautauqua Institute in New York. At the age of 13, she received her ARCT Diploma from the Royal Conservatory of Music, and completed her Licentiate Diploma in 2015, receiving First-Class Honours with Distinction. Charissa currently studies with Professor John O’Conor at the Glenn Gould School, and is a former student of Dr. Michael Esch. She is a recipient of the Janet and Bill L’Heureux Scholarship. Saturday December 9, 2017 at 7:30pm: Trevor Dearham conductor, “Christmas Masterpieces: Sing-a-long” featuring Boyce’s Symphony #1, choral selections from Handel’s Messiah and carols with York Festival Chorus. Saturday, March 3, 2018 at 7:30pm: Sasha Weinstangl, conductor, “J.S.Bach: The Master” Brandenburg Concertos, #3 and 6. Keyboard Concerto, Hilary McLaughlin, solo. Selections from Cantata BWV 209, and St Mathew’s Passion with Irene Ilic voice, Susan Barak, violin. Saturday, May 26, 2018 at 7:30pm: Sasha Weinstangl, conductor, “European Masterpieces” Bach’s Brandenburg Concerto #2 with soloists from YCE. Mendelssohn’s String Symphony #8 and Faure Requiem with York Festival Chorus.